will link you to over 280 city, state, and national vaults of information (though we’ll leave the altogether reasonable question as to how open is “open” to Mr. Snowden). is not to be confused with that city’s transportation-specific RATP pages, the object of two May posts. Rough translation: The students in these schools were deported, and died, because they were born Jewish. The psycho-historical impulsion driving the installation of the plaques, veneered atop France’s equivocal behavior during the war, is for another post (see this one for a bit of deep background); but whatever the accounting, the plaques are there. And analyzing them takes a bit of work. The workbook comprises three sheets (Feuilles in French), one of which lists but 48 plaques and halts somewhere in the 2nd Arrondissement, or district (of which there are 20 in Paris). The other two apparently register 1219 plaques, but the sheets are not identical, though it very much appears as if they could have alloyed into one without experiencing any loss of telling information. One sheet, number 3, is the cleaner of the two, matching addresses to each of the plaques along with its arrondissement and remaining faithful to the French character set; but number 4 affects the supplementary virtue of citing address latitudes and longitudes. Starting with sheet 3, and assuming we want to ultimately subject the data to a round of pivot table breakouts, by say, arrondissement, we need to insert a row above 2, thereby detaching data artisan Martin Maginier’s Twitter handle in A1 from the records. Next, select all the data and turn off the Wrap Text effect glowing in the Home tab > Alignment button group (the addresses have been duplexed into tiers within their cells in the B column, an Excel loss-in-translation from the spreadsheet’s native Google Doc platform). Had the header row been distinctively formatted at the outset – even by the mere imposition of a boldface, for example – Excel would have ticked My data has headers without prompting. Now the key to Remove Duplicates is to appreciate which fields need be inspected for trouble-causing, as opposed to perfectly well-intended, duplications. For example – if you tick Arrondissement alone, you know what’ll happen – about 1190 records will be carted away, because each of the 20 arrondissement names are all but sure to appear recurrently in that field. In our case, then, we’re best off probing for duplicate records that exhibit equivalent data in all their fields – because those one are surely superfluous. And once we actually get around to clicking OK, Excel broadcasts an immediate prompt, announcing the offloading of 13 duplicate records. Now we can begin to do something about the Arrondissement field, its contents freighted by those “…ème ARRONDISSEMENT” qualifiers that, in my view, distend the records unprofitably. It seems to me that a simple 2 in a cell would serve the analysis every bit as well as 2ème ARRONDISSEMENT; the question is how to pare the excess text. Copy say, any entry for 2ème ARRONDISSEMENT among the data. Delete the number 2, because we want to conduct a generic Find across the all arrondissement data, all of which display the above suffix. 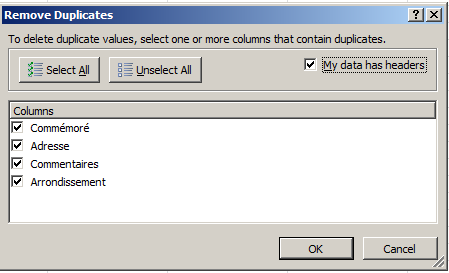 Leave Replace with blank and click Replace All. Then type or copy 1er ARRONDISSEMENT in the Find field, because we need to contend with that “er” following the 1. 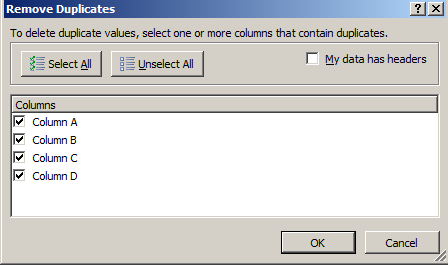 Delete the1, leave Replace with blank, and click Replace All. It sounds longer than it takes, and once completed you’re left with a column of freshly shorn digits. To interpret: only double-figured Arrondissement data exhibit a length of 20 characters (trust me; I’ve checked). Thus the formula above stipulates that two characters be wrenched from the left of any such expression – even as any other-lengthened entry will be made to surrender but one – that is, one digit. Keep in mind that numerically-consecutive arrondissements aren’t necessarily adjacent in space; the 13th is at some considerable remove from the 12th, for example. And I hope to have more la semaine prochaine.